Actually, it’s twitter that brings the world closer together. And it’s because of twitter that I got invited to eat bacon, lettuce and tomato sandwiches with friends from around the world today. Virtually, of course. It all started with a conversation about bacon between Cheryl in New York and Ellise in Paris. Cheryl had bacon, but no lettuce and tomato. Ellise had lettuce and tomato, but no bacon. They joked about getting together for a BLT lunch. 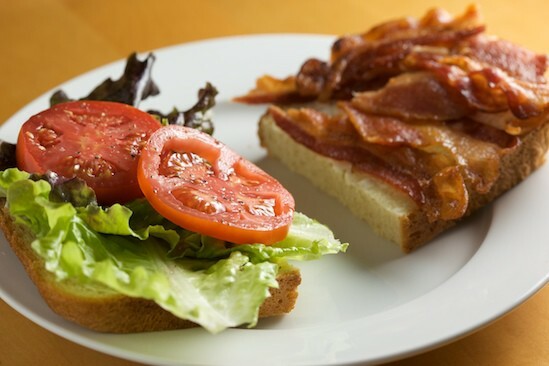 Never one to miss out on a conversation about bacon, I chimed in that I had all the fixings for a BLT and had already planned on making one soon. Next thing I knew, I had been invited to the virtual BLT Lunch on twitter! Within a matter of minutes, there were others! Karen from Atlanta had some fresh-baked rye bread she thought would be perfect. Kim from South Carolina promised to show up with a Fried Green Tomato BLT. 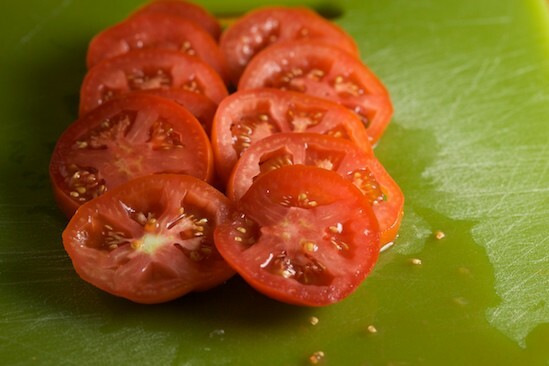 Cathy in California wanted to introduce us to her BLTea featuring her Smoky Tea Tomato Preserves. You see, bacon really does bring people together. So are you wondering how on earch we could all meet for lunch on twitter? Simple, really. 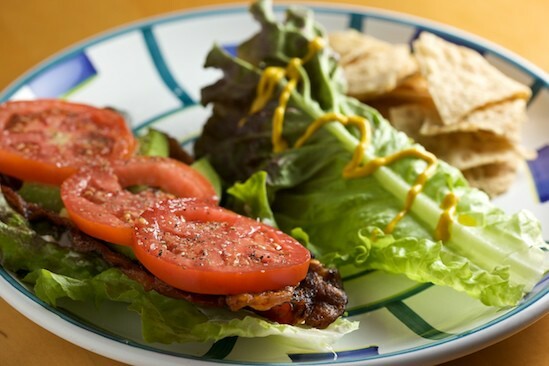 We all made our favorite version of a BLT (bacon, lettuce and tomato sandwich) at some point during the week, and photographed it. Today, everyone is sharing links to photos and blog posts via twitter. We’re using the tag #BLTLunch to make it easy to find each other. It might not be the same thing as getting together in real life, but it’s a whole lot of fun nonetheless! So it turns out that my contribution to the BLT lunch was actually last night’s dinner. My cousin Corinne, her husband Jason, and best friend Janet are all staying at my house for a few days, so of course they had to be included in the BLT action! They are in town for Comic-Con, so I had to do something special to lure them back to the house to eat sandwiches for dinner. Homemade bread (of course) did the trick! I wasn’t sure which type of bread I should bake, but I wanted it to be something new and something that I wouldn’t be baking as part of the BBA Challenge. I finally decided on Sheepherder’s Bread, because I have been fascinated by a recipe I had seen in one of my cookbooks recently. 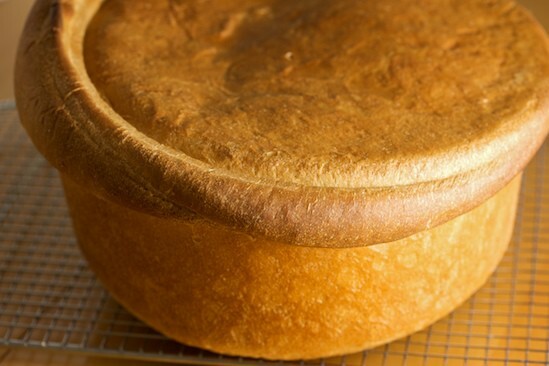 It’s just a basic white bread, but it’s a huge loaf that is baked in a big cast iron dutch oven. The part that fascinated me was the instruction to let the bread rise until it actually pushed up the lid of the pot by 1/2 inch. 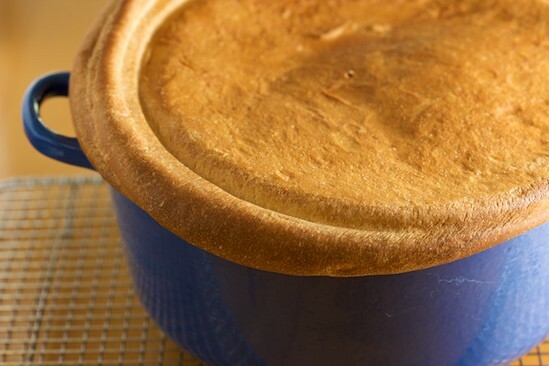 Then, the bread goes into the oven with the heavy lid still on the top, although the lid gets removed partway through baking to allow the top to brown. Interesting. I accidentally let the bread rise too long, and instead of pushing the lid up half an inch, it kind of spilled out the side a bit. I should have paid more attention to the part in the recipe that told me to watch it closely. But, it still worked! Since it proofed too long, the top wasn’t domed, but it was still a successful loaf. And did I mention that it was big? The only real problem I had was trying to figure out how to slice this thing to turn it into sandwich bread! I guess the homemade bread trick worked since the gang made it back in time for dinner. They even stopped by Whole Foods and picked up some gorgeous tomatoes on the way home! And now for the sandwiches! Corinne also hid some avocado in there! 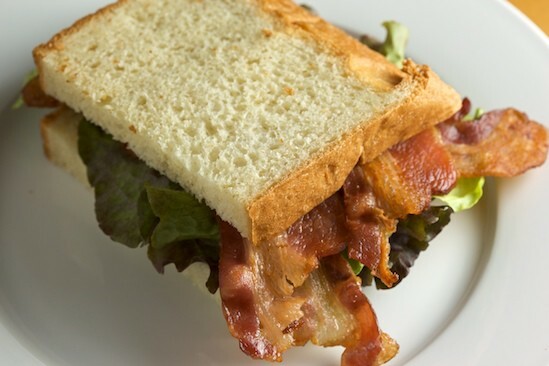 Now this sandwich is a bit deceiving since it looks like there are only two strips of bacon, but she actually hid an extra layer of bacon on the bottom! And now for Jason’s sandwich. Again, untoasted bread! And no tomato?? But I have to give him points for using extra bacon. And here’s mine. I opted for my classic BLT: toasted bread, mayo, bacon, lettuce and tomato. We all enjoyed our BLT dinner and I can’t wait to see what everyone on twitter brings to today’s BLT Lunch! 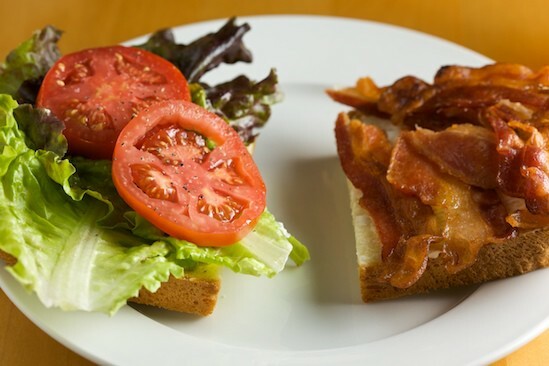 Cheryl’s BLT on homemade focaccia features a woven mat of bacon and can be seen at A Tiger in the Kitchen. So, are you following me on twitter? And if twitter isn’t your thing, you can also find Pinch My Salt on Facebook now! Lots of things I create in my kitchen never make it to this site, but you’ll find me talking about it all on twitter and Facebook, including lots of photos. Hope to see you there! « Cinnamon Rolls or Cinnamon Buns? Delicious Either Way! Isn't this fun? I love your bread and see that you have the same beautiful blue Le Crueset pot that I do...like minds, eh? Let's do lunch again, OK? That bread is a thing of beauty! Can you share from which book you got the recipe? I'd love to try it. What fun! 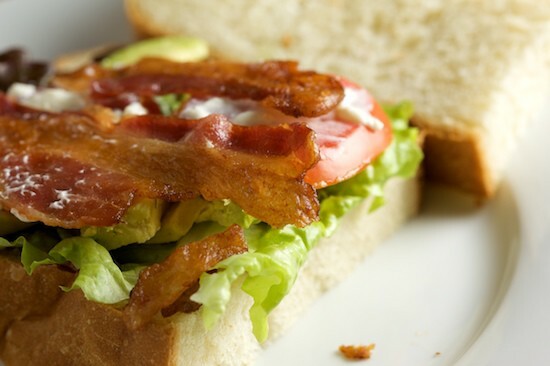 A BLT could definitely bring the world together. The bread looks beautiful- I love the pattern in the top. My goodness! There's is nothing more delicious to eat but bread and bacon. This really looks tempting. Nice bread you have there. Bacon makes the world go 'round! 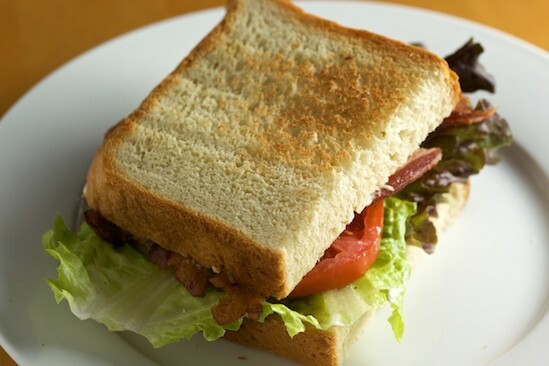 All this BLT talk, I'll now have to go make myself a non-virtual one for dinner! wow! I'm jealous, I like your version the best Nicole! :) Classic is the way to go on a BLT! Delish!! ~ so funny, cause hubby and i were having sandwiches for lunch yesterday (tuna...total comfort food : craving it all week) & he commented on my relentless intent to have buttered TOAST as the bread (took 2 mins extra ~ serious,big deal, yes!!) ...i had to remind him that every good tuna & BLT had to have 'buttered' bread/toast... gotta make BLTs this weekend!! Thanks for such succulent virtual treats!! Those sandwiches look great! Bacon is truly a versatile and satisfying food! I love making bread and Michael loves anything bacon. Very yummy looking sammie! OMG, this is too funny! I hadn't had a BLT sandwich in at least 5 years (since moving to Germany from the US) and just this past week I had such a craving for BLTs that I ended up fixing it for dinner one day, and also taking some over to my BFF for lunch another day. Should've taken a picture! Your sandwich looks delicious! What a gorgeous loaf of bread! This has been my favorite sandwich since I was a little girl! BLTs have been my pregnancy food of choice. I'm really not sure there's a better sandwich, and all the better when people use technology to unite over it. Beautiful beautiful bacon. Have you seen Jim Gaffigan's bit on the glories of bacon? Worth a look. 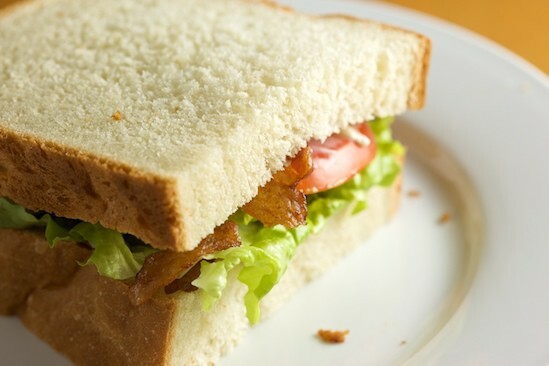 the bread is beautiful & the BLT looks so delicious! i very much enjoy your blog & photography. 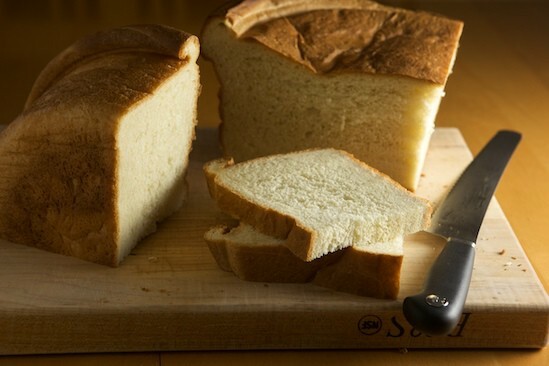 will you share/post your sheepherder's bread recipe? i'd love to give it go. That has got to be the best-looking BLT I have ever seen. All that crisp bacony goodness has me drooling over my keyboard! Bacon is probably the most significant reason that I could never go vegetarian. I love bacon. I love BLT's.... especially during home-grown tomato season. Your photos are lovely! I'm with you - toasted is the way to go! That bread is sinful! Literally :DI want. But I'm doing BBA! Gosh :D i will never tire of bread! Wow all great sandwiches! I'd have to say yours is on the top of my list because I too love the toasted bread! This bread looks amazing. Are you going to post the recipe? These pictures are of such high quality. They look better than menu pictures. I would be afraid to post a picture of my BLT's. What an interesting blog thank you. Keep up the good work.